Romance Excerpts Only Blog: Wolf Caller 1: Control Now Available! GET YOUR JUST DESSERTS THIS VALENTINES DAY!! Wolf Caller 1: Control Now Available! Wolf Caller 1: Control, the first book in my new werewolf series, is now available from Changeling Press. As their world draws closer to war, the future of Albion is in the hands of a werewolf pack who must protect the country’s most carefully guarded secret, a new magically-generated fuel source. Rumors about the mysterious Lord Derek Valmont abound, but no one in Albion’s Upper Circles knows the whole truth. Valmont is a werewolf. He’s also an operative for the Office of Clandestine Affairs. 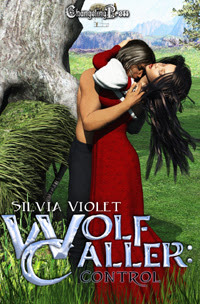 Captivated -- literally -- by the hauntingly beautiful wolf caller-witch Serena, he’s furious that he can’t break the hold she has over him in wolf form. When she flees their encounter he drinks in her lingering scent, determined to find her again -- on his own terms. But before he convinces her to use her powers to aid his pack and his government, he’ll take her to his bed and prove he’s the one in control. Serena may not be able to control the man as she does the wolf, but she's got an agenda of her own -- and her sights set on both the Alpha, and his second in command.